Third statewide Honor Flight Maine Telethon helps sends veterans to Washington D.C. Thanks to Mainers, NEWS CENTER Maine's third Honor Flight Maine telethon raised more than $145,000. PORTLAND/BANGOR (NEWS CENTER Maine) -- On November 15, NEWS CENTER Maine held its third statewide Honor Flight Maine Telethon to raise money in support of Maine’s veterans. As of this writing, NEWS CENTER Maine’s 2018 Honor Flight Maine Telethon has accepted donations from individual donors and sponsors totaling $149,028 along with $15,095 in pledged checks. With a grand total of $164,123 and growing. The money donated will help transport at least 235 veterans from Maine to Washington, D.C. where they will tour and reflect on the war memorials built in their honor. Top priority is given to senior veterans, World War ll veterans and veterans of all wars who are terminally ill. Volunteers from several organizations joined forces with NEWS CENTER Maine to answer calls at the in-studio Portland and Bangor phone banks. Vasel was on an Honor Flight Maine trip in April 2018. He sat down with NEWS CENTER Maine’s Shannon Moss and shared his memories about World War II and his HFM trip. 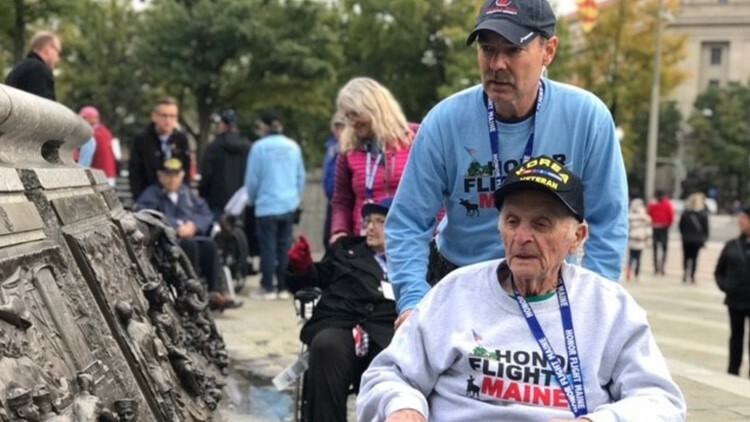 In the telethon’s first two years, NEWS CENTER Maine is proud to have helped raise more than $279,000 for Honor Flight Maine and help send 400 veterans to Washington D.C. The opportunity to donate to Maine’s Veterans is still open. Visit Honor Flight Maine to donate to the Maine cause or visit Honor Flight Network to find and donate to an Honor Flight in another state. Thank you to our sponsors Rowe Auto Group, Eldridge Lumber, S.W. Collins Company, Friend and Friend and Newport Glass for helping to send our Maine veterans to Washington, D.C.
For the full story leading up to the telethon, CLICK HERE.